For a number of years, my handheld light meter puzzled me when it came to indoor orchid growing with fluorescent lights. I used it to adjust the height of lights above my Phalaenopsis, only to see the leaves redden up notably at just 600 footcandles (fc) on the light meter. That should be quite a low light intensity. 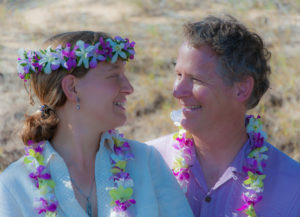 Dropping the light into the 300-400 fc range brought back the green — with still profuse growth and blooms. The light meter itself wasn’t the problem. It was good quality, and read consistently outside. In direct sun at midday, it would be 9,000-10,000 fc, and drop to 4,500-5,000fc with 50% shadecloth, as expected. I’ve consistently tested many different percentages of shadecloth, and it was accurate. Over many seasons, arranging the outdoor growing areas with footcandle readings has produced predictable results. Eventually, I gave up on the light meter for indoor orchid growing, figuring that mine just didn’t measure footcandles accurately for non-solar light sources for some (unknown) reason. I worked out the locations of plants, and heights of the T5 HO fluorescent lights by observation, and have had excellent indoor orchid growing results, both for growing under lights full-time, as well as supplemental lighting. But I still have always been bothered by the poor correlation between the light meter and the T5 HO fluorescent lights. There was something that I didn’t understand. Then came LED lighting — and with it, a more comprehensive way of understanding indoor horticultural lighting. I intuited most of these concepts by trial and error, but it was gratifying to see the technical descriptions. LED lights can take indoor orchid growing to a new level of quality and consistency. 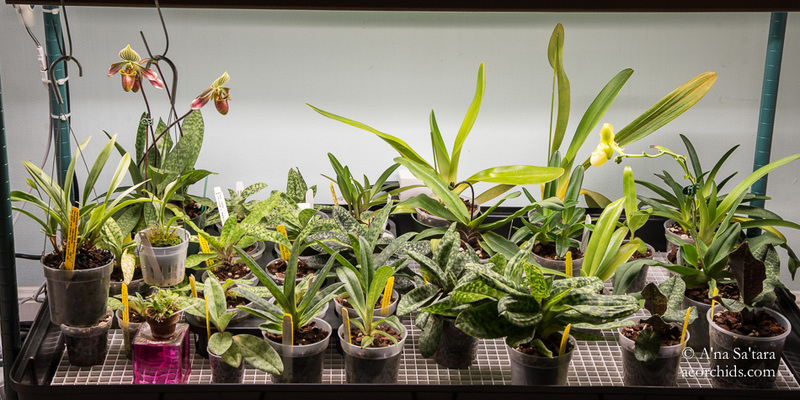 There are opportunities for creating orchid growing areas beyond the scope of what has been possible with T5 HO fluorescent lights and their predecessors like sodium and metal halide lighting. 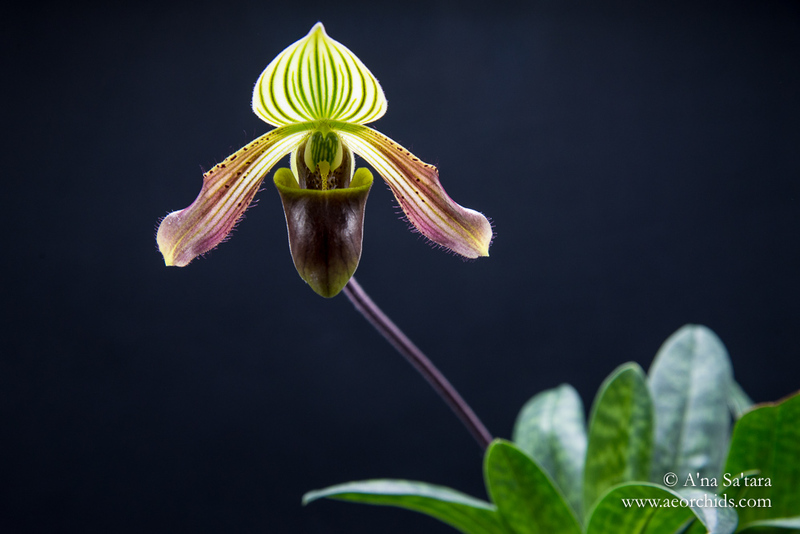 In this article, I explain key differences relevant to orchid growing under LED lights, and new ways to think about orchid growing under lights. 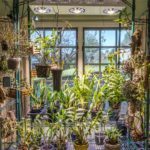 With some simple shifts in how you think about non-solar light sources, you can greatly improve the design of your orchid growing area and improve the well-being of your orchids. 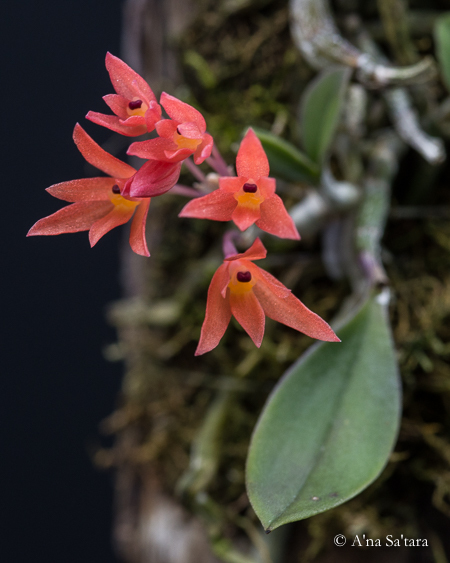 The best place to start our discussion is at the source of photosynthesis: the wavelengths of light stimulating the metabolism of orchid growth and flowering. In the early days of horticultural LED light production, it was economical — and seemed practical — to primarily use select wavelengths of red (mid 400s nm) and blue (mid 600s nm) light with the strongest stimulation of photon receptors in plants. 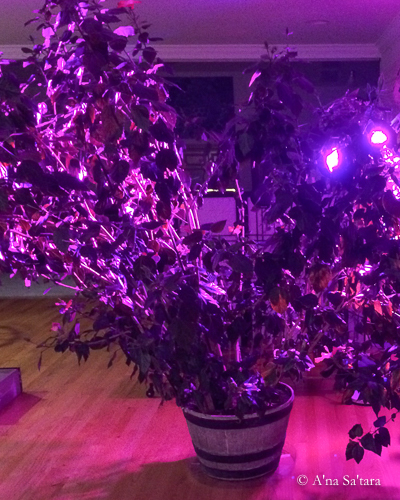 These lights produced a quite unique growing area (see photo): everything was bathed in a disco-like pink and purple glow. Technology and thinking have co-evolved in the past few years to enable the production of white light LEDs that more closely match the full suite of natural sunlight, and appear like “normal” light. While certain wavelengths of light might be more significant, it is recognized that plants have evolved with the full solar spectrum for millions of years, and therefore, it would make more sense to replicate THAT spectrum than expect an optimal result from a subset of natural sunlight. The concept of “full spectrum” is a bit muddy, however, for orchid growing under lights. Aren’t T5 HO fluorescent lights “full spectrum”? It says so on the label and the box. But have you ever seen a spectrograph of T5 HO fluorescent lights? I’ve only seen general references to the wavelengths emitted, which include the “full spectrum” from 400-700nm. When I saw the series of spectrographs below from Active Grow LED, then I understood! There’s a big difference between an LED light source that provides a continuous full spectrum of natural light and a fluorescent bulb that provides some isolated wavelengths within the full natural light spectrum. (I actually watched the entire Active Grow LED video of their testing demo, where they showed the genuine test setup, bulbs, and video of their spectrum readings. The dramatic difference is real, not just well-chosen marketing images). Comparison of light spectra between T5 HO fluorescent lights and Active Grow LED T5 replacement lights. From Active GrowLED product data sheet. I have searched for other spectrographs, for the T5 HO fluorescent lights that I use, from Hydrofarm and Sun Blaster, but have not been able to find any information or comparative testing. There are definite differences between different T5 HO fluorescent light manufacturers. For instance, Hydrofarm Agrobrite lighting appears more “blue” than the comparable 54W Sun Blaster fluorescent light. However, I suspect that the general pattern is similar to the spectrograph above. The significant difference between the “real” solar full spectrum and the fluorescent full spectrum lighting offers a plausible explanation why the light meter does NOT produce the same results for natural sunlight as indoor orchid lighting. The source spectra are radically different and cannot be measured in the same way. 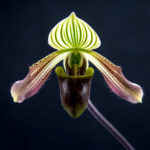 We need a new way to think about growing orchids under lights — going beyond footcandles or lux from the light meter, as I titled this article. 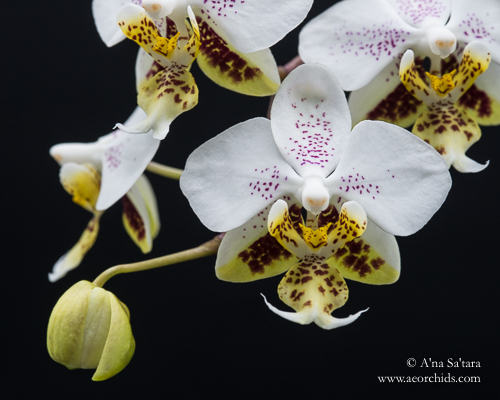 The key is to consider the source light spectrum and how much of it can actually be used by the orchids. When using footcandles or lux to assess the amount of light needed by an orchid, we take the light spectrum for granted. The solar light spectrum is a planetary constant, with some shifts in wavelengths by season (in temperate locations) and at different times of day. These shifts aside, orchids grown with natural sunlight receive a full breath of the light spectrum. In the spectrograph above, this is obviously not the case for fluorescent lights. However, now, with the advent of white light, full spectrum LED horticultural lighting, indoor orchids have the opportunity to receive a light spectrum MUCH closer to natural sunlight. So it’s easy, right? We can just stick the light meter under the LED lights, and carry on like the outdoor shadehouse or greenhouse? Not so easy, actually. While sunlight has ONE “manufacturer,” that’s not the case for LED lights! Different manufacturers of LED lighting make very different strips and panels of LED horticultural lights. Check out an online LED or hydroponics store and you will be dizzy with the selection. The good news is that there is more transparency and standardization for horticultural LED lighting than “full spectrum” T5 HO fluorescent tubes. There are several widely used terms and concepts that describe the light output of horticultural LEDs. With these, and a calculator, you will be better able to evaluate what your orchids will actually be receiving. The first building block of an LED light source is “photosynthetically active radiation” (PAR). As the term suggests, these are the light wavelengths used for photosynthesis. It describes the quality — not the quantity or intensity — of light from a source. Said another way, PAR is what a plant “sees”, and hence uses, for growth. PAR is not what a human sees (and values) in the visible light spectrum. Humans are most visually sensitive to green light, which is of low photosynthetic value (green wavelengths are reflected rather than absorbed by the plant). Lumens and lux are weighted for the brightness to human eyes: values relevant for human indoor lighting are NOT indicative of the quality of light for plant indoor lighting. This is a very significant distinction. The lumens from a grow light (or the wattage consumed) are NOT telling you anything about the light that an orchid can use for growth (PAR). When selecting an orchid grow light, suffice to say, you will want to have a high PAR. The PAR (quality of the light spectrum for plant growth) is measured by photon flux. Photon flux is a measure of intensity. Again, intensity for the purposes of plant growth is NOT the same as visible brightness to people. When calculating the photosynthetic photon flux (PPF), the human-observed brightness bias is corrected by effectively equalizing the measurement of all visible wavelengths present. PPF is measured in micromoles per second (umol/s). It is the total light output reading from a photon source. BUT the total light output does not tell us how much of that light output is actually reaching the plants. For that, we want to know the Photosynthetic Photon Flux Density (PPFD). Now we reach the key measurement: how many photons are reaching a given area each second. For the purposes of orchid growing, it doesn’t matter how much light is “sent” from the source, but how much is “received” by the orchid. Of course, greater intensity (PPF) will make more photons available. But available photons diminish based upon how far the light source is from the plant. This concept is very familiar from growing orchids under fluorescent tubes. Less light is available if the tubes are further away. One of the benefits of LED lighting is the ability to place LED lights closer to plants with less risk of damage from heat. PPFD is measured as micromoles per meter squared per second (umols/m2/sec). Since distance between the light source and orchid is so important, the most valuable measurements with which to compare LED lights are the PPFD at a given distance. It is common to see something like 400 umol/m2/sec at 24″ (61cm), which indicates how many photons are reaching the plant surface (canopy) at 24″ (61cm) from the LED light. This final calculation of measuring indoor light is the culminating goal for orchid growing: how much photosynthetically useful light does the orchid receive in a day? 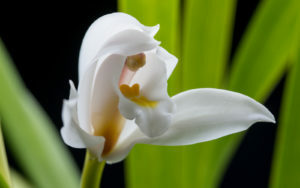 The concept of the daily light integral (DLI) is very familiar, as it underlies the optimal footcandle or lux levels that everyone reports for different genera, e.g., 500-1500fc for Paphiopedilums, 2500-4000fc for Cymbidiums, etc. At a given natural sunlight intensity, an orchid will receive enough energy to support healthy growth and flowering. It is notable, though, that you rarely see a time period associated with these footcandle or lux recommendations. I guess that it is assumed that a greenhouse will get around 8 hours of light a day, with less in winter and more in summer. 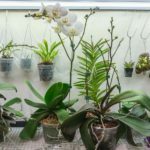 If you’ve ever had a growing area with partial day shade, or climatic variability like seasonal fog on the coast, you will have quickly realized that these idealized footcandle values are just that — ideals which, in practice, may result in too much or not enough light for your orchids. In a synthetic growing environment, indoors under lights, there is considerably more control and conscious design of the amount of light reaching the orchids each day. To compensate for lower light levels, growers often run their lights longer each day. The goal is to reach the total number of photons per day needed by the plant — you can provide higher intensity for a shorter period, or lower intensity for a longer period. It’s like having a set distance to walk. If you walk faster (more intensity), then you can reach the destination in a shorter period of time. Likewise, you can’t go so fast that your body is unable to keep up with your metabolic demands for air, water, and energy conversion. 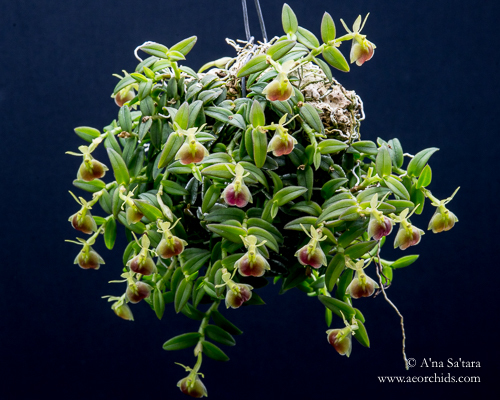 Dendrobium lawesii growing under LED lights. Note the three new canes developing in addition to the flowers on the older canes. An orchid is similar — too much light, and their photosynthetic metabolism can’t sustain itself, and chlorophyll molecules begin to break down (seen as leaf reddening from anthocyanin pigmentation). Different genera have different optimal levels of “workout” intensity for photosynthesis. More (light) isn’t necessarily better if the quantity exceeds the capacity of the orchid to make use of it without incurring cellular damage. The daily light integral is measured as mol/m2/day. Here’s a handy online DLI calculator. All you need to do is input the PPFD of your light source and the number of hours that you will run it. What is the optimal DLI? I’ve researched for orchids, and the only reference that I found was for Phalaenopsis, which have DLI range of 4-10, with a DLI of 4-6 as “good” for commercial production. I’ve calculated the DLI in our growing area for Phalaenopsis and Paphiopedilum, where I’ve observed good growth and flowering, and I’ve found it to be 4-6, depending upon where the orchid is sitting under the fixture. From this starting point, it should be possible to generate some initial estimates for other genera. I calculated a DLI of 10-15 for flowering cattleyas under lights based upon the success that one reviewer reported using a particular brand of LED lights for 16 hrs/day. Hopefully, in time, there will be an accumulation of growing experience to offer recommended DLI values much like those commonly shared for footcandles and lux. One of the benefits of LED lights is that there is more uniformity along a given strip, unlike the higher light to be found in the center of a fluorescent light tube, tapering to the edges. Depending upon the distribution of the LED diodes, the area under a panel will vary, with the edges receiving less light than the center. DLI is a “spot value” and you will need to take the variations in light distribution across your growing area into account. If you would like to delve into some more technical details of horticultural LED lighting values, there is a more comprehensive review here. I have done my best to summarize and select the most relevant factors for orchid growing under lights, to provide clear and basic concepts for designing an effective growing area and evaluating LED lighting options for orchid culture. One of the very attractive aspects of LED lighting (for all purposes) is their notably lower use of electricity compared to the previous generations of lighting sources. The wattage of the light, however, does not tell us anything directly about the useful photons produced for the orchids, as described above. The measurement that connects the electricity usage of the light to the “useful” photosynthetic energy produced is called PPF Efficiency and is reported as umol/J. The higher the umol/J, the more useful photosynthesis that can come from the electricity input. For reference, an efficient level of energy production would be 1.5 umol/J, with values greater than 2.0 umol/J being very efficient. This is a moving target as LED technology develops further and becomes more energy efficient. The “indoor sun” provided by a high intensity white light LED fixture from Amare Technology. I use two of these fixtures in two 4×4 growing areas: one year-round and one for indoor wintering of Cymbidiums and Dendrobiums. When considering PPF and available photosynthetic energy, in general, there are two different types of LED lights: “regular” and “high” intensity. That’s not an official commercial designation, but it is a practicable one. By regular intensity, I am referring to LED light strips and panels that do not require additional cooling. There is no fan, and they are effectively silent, like a regular light bulb. High intensity LED lights (see photo) require some sort of cooling, either on-board with a fan, or attached to a ventilation duct, to accommodate the heat output of the fixture. These high intensity LED lights are generally used for full-sun plants, like cannabis, and have developed very sophisticated technology for a growing commercial marketplace. They are also used for indoor “rainforest” or museum environments, to provide a powerful light source with significant canopy penetration; that is, higher intensity light reaching several feet from the source. The “regular” intensity LED panel and strip lights are commonly used in vertical growing setups (stacked shelving units), such as for microgreens and lettuce. They are becoming more and more in-demand as indoor agriculture increases. I invite you to read my other articles on our applications of LED lights for indoor orchid growing. I describe our use of high intensity white light LEDs, and our recent replacement of T5 HO fluorescent lights with T5 HO LED tubes and LED strip lights for a vertical growing setup (article coming soon). 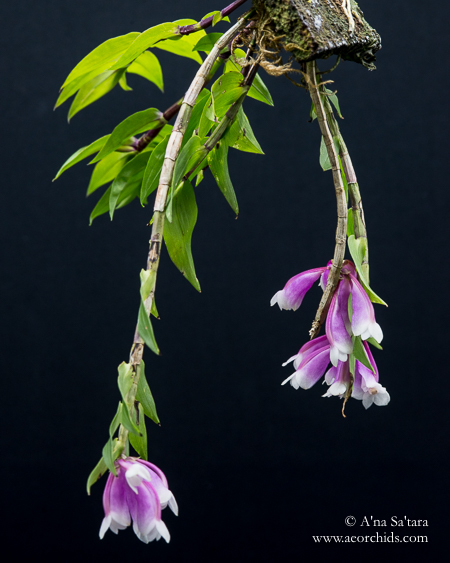 LED lighting has opened up a new era of orchid growing under lights. 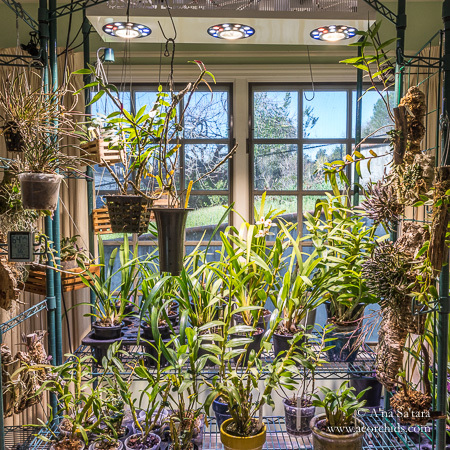 With diverse options for shelving, supplemental lighting, and free standing growing areas, many more species can be accommodated, allowing for specialized environments to be created, and the ability to grow many orchids without a greenhouse. A spare room or basement can become a small orchid nursery. Compared to previous horticultural lighting sources, LED lighting makes this possible by providing 1) full natural light spectra, 2) high to low light intensity for different species, and 3) energy/heat efficiency. 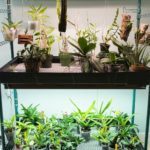 It is my hope that this article provides an introduction to the new concepts and terms associated with LED lighting so that you can make sound choices in lighting purchases, and design an effective indoor growing area for you orchids.